RMA Practice Tests are an ideal way to prepare for your upcoming American Medical Technologists (AMT) Registered Medical Assistant certification (RMT) exam. The RMA medical assistant exam is intended to certify that a candidate has the knowledge, skills, and abilities to perform the duties of a Medial Assistant. The RMA exam consists of 200-210 questions on various Medical Assistant job functions (e.g., general, administrative, and clinical). 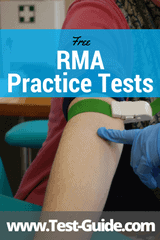 Our directory of free RMA practice tests are listed below. Taking sample questions is an effective way to study for your Medical Assistant certification exam. Our free AMT-RMA sample tests provide you with an opportunity to assess how well you are prepared for the actual test, and then concentrate on the areas you need work on. Test-Guide.com's RMA sample questions are an excellent way to study for your upcoming certification exam. Our sample tests require no registration (or payment!). The questions are categorized based on the RMA test outline (see below) and are immediately scored at the end of the quiz. Once you are finished with the quiz, you will be presented with a score report which includes a complete rationale (explanation) for every question you got wrong. We will be adding more sample test questions in the near future, so please come back often. If you like these Registered Medical Assistant practice questions please make sure to like us on Facebook! Increasing Your Speed - The RMA exam has a three hour time limit. Although most students who take the RMA feel that there is sufficient time, taking the practice tests with self-imposed timers help you budget your time effectively. You should budget approximately 1 minute for each question. Becoming comforable with the Test Format - Every standardized test has its own unique format. As you take practice RMA tests you will become comfortable with the format of the actual test. Once the test day arrives you will have no surprises! Concentrating Your Prep Time - As you take more and more sample quizzes you begin to get a feel for the topics that you know well and the areas that you are weak on. Many students waste a lot of valuable study time by reviewing material that they are good at (often because it is easier or makes them feel better). The most effective way to study is to concentrate on the areas that you need help on. The RMA certification exam consists of 200-210 questions that count towards your score. All of the questions will be multiple choice questions with four answer options. Category 1 : Education - You are a graduate (or soon to be graduate) of an accredited medical assisting program that has a minimum of 720 hours of training, including 160 hours of clinical externship. Category 2: Military - You are a graduate (or soon to be graduate) of a medical services training program of the United States Armed Forces. Category 3: Work Experience - You have been employed as a medical assistant for a minimum of 5 out of the last 7 years. Candidates for the RMA exam will be issued a Authorization to Test letter after applying for certification. Once the letter is received, candidates can schedule their test location and date directly with Pearson Vue (www.pearsonvue.com). Candidates can reschedule their exam without any additional fees as long as their requests are made with Pearson VUE no later than one business day prior to the original appointment. If a cancellation is made less than one business day before the appointment the registration fee is forfeited and there will be no refunds. If you take your exam on the computer, your examination results will be available immediately. Paper and pencil test takers will receive their score reports within 6 to 8 weeks. The passing score for the exam is a 70. The passing score is a scaled score (based on a range of 0 to 100) and does not equate to a percentage of questions answered correctly. If you pass your exam, your score report will show only your score. If you fail the exam, your score report will show your score as well as information on the sub-sections of the exam that you did not do well on. This score report can help you focus your studies for your retest.